Literal translation: “I want a doll box not black box operation,” where “doll box” (公仔箱) is both an early term for TV and an abbreviated pun on “fair system” (公平制度). This phrase was the dominant meme/slogan in Sunday’s protest. 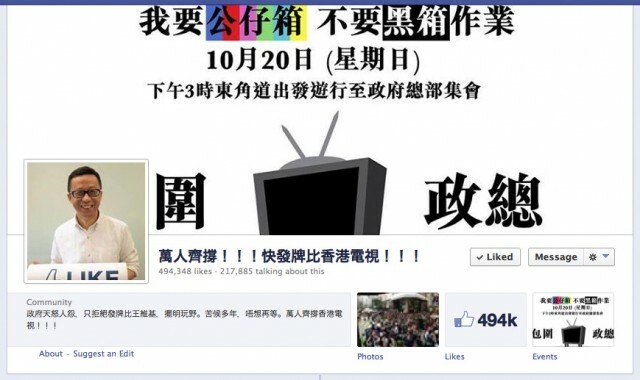 By the time the protest started, the Facebook page supporting the HTKV’s failed bid had already garnered over 400,000 likes. It currently stands at 491,430 likes at the time of writing. Given that Hong Kong only has a population of 7.16 million people, and that the page was created six days ago, that is no easy feat. The protest itself was attended by anywhere from 36,000 people (based on conservative police estimates) to 120,000+ people (based on optimistic organizer estimates), with the truth probably somewhere in between. 9 This flurry of activity was mirrored online. The hashtag 香港電視 (translation: HKTV) on Sina Weibo has led to 4050 discussions during the past seven days; hashtag #wewantfreetv has led to 206 tweets10 over the same period; and there are over 2,400 (public) photos tagged #wewantfreetv on Instagram. I joined a portion of the protest outside the government headquarters. As with other Hong Kong protests, people were wearing black to show solidarity; there was a diverse array of placards, signs and the occasional effigy; slogans were chanted and notable figures were giving speeches on stage. While hundreds of photos were posted to the popular Facebook group (I counted at least 400), it was not there nor on Sina Weibo that people were posting their photos; it was on Instagram (which garnered over 2400 photos). Who would have thought of Instagram as a forum for public discourse? And of course, the first Instagram photo on #wewantfreetv also happens to be a selfie. Posted three days before the protest began. Not everything on Instagram was a selfie or a photo of the protest. People still had time to make some interesting art. For example, here’s an advanced smartphone creation – a multi-photo collage that creates an air of death around Rilakkuma. And of course, what would we do without cats? The Real Hong Kong News has been tirelessly translating HK Chinese newspapers articles into English in a series called, “Free-To-Air TV License: Conspiracy, Scandal, Justice and More” – here’s part one (of four). Dictionary of Politically Incorrect Hong Kong Cantonese has a short writeup on the ascent of the chicken broth meme, which we didn’t have the space to cover here. 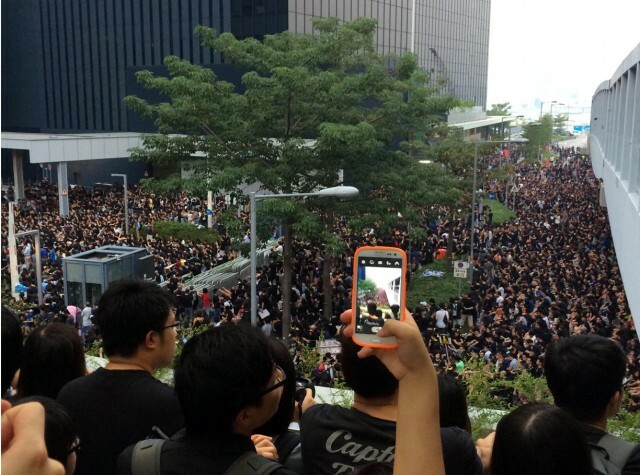 The South China Morning Post wrote a nice roundup of Sunday’s protest as well. And if you want to find out more about Hong Kong’s political system, and where exactly the Executive Council sits, read up on The Real Hong Kong News’ Overview of HK’s Political System.